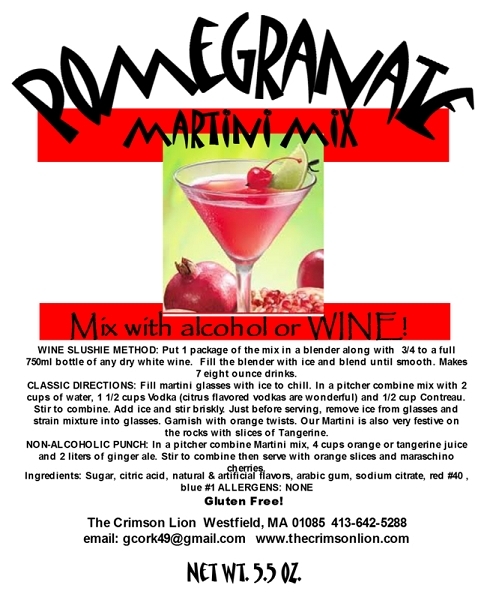 Pomegranate mix produces a terrific flavor. * As a frozen slush drink, a popular method is using a blender. To make use 3/4 to a full 750 ml bottle of white dry wine such as Chardonnay. Add one package of the mix and fill the rest of the blender with ice. Blend Smooth. Yields (7) 8 oz. delicious drinks. As an option an on the rocks drink such as a Pomegranate Martini is popular. Please review product label for additional options and recipe ideas.